Neal Patterson took a train ride to Kingman, Arizona. His first train ride in over 30 years (his last was in Alaska). He was met by his daughter Carol Boeckor of Las Vegas and granddaughter, Heather Kineol and finance Dan Jensen of Burlington, Iowa. The happy group took a trip to Oatman, AZ where Carol showed The Quill to some burrows while Neal fed them carrots. The next day the group set out for the Grand Canyon where they did the "Sky Walk" at the west rim on the Huala pai Indian reservation. 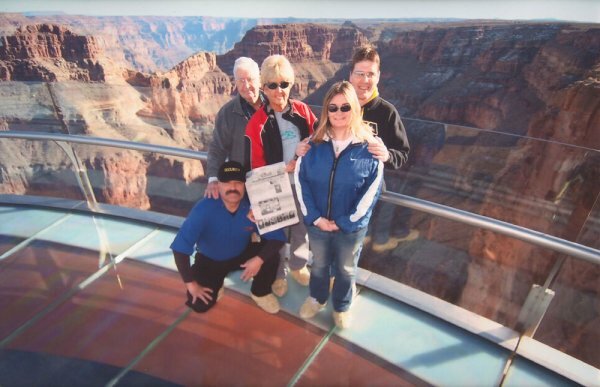 Shown are Neal, Carol, Dan and Heather with the security guard Lawrence Aguilera. When you go on a trip, take "The Quill" along and capture your picture with it and submit it to us. Let's see where all The Quill" can travel.